'With long periods of time on their hands between one whale and the next on what could be as much as three years or more at sea, Yankee sailors took up the art form as a way to pass the time. But at sea, the only ivory and bone available to them were from the whales they hunted. 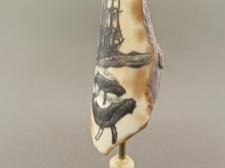 This nautical expression of the art form soon passed from ship to ship and it was not long before scrimshaw was introduced to coastal native cultures in Alaska, who immediately embraced the art form.' This excerpt was taken from 'Scrimshaw Studio' indepth information on the history of scrimshaw. 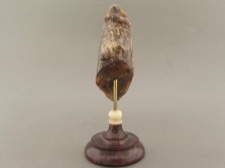 Fossil walrus tooth is very old, ranging from 300 to 3000 years in age. It is dug out of the Alaskan permafrost in August and September. 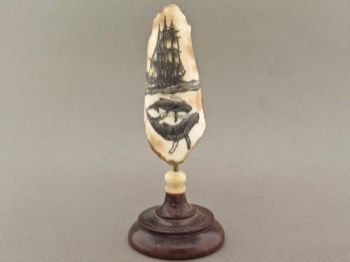 It is a popular canvas for scrimshaw and is also used for tools and symbolic objects. 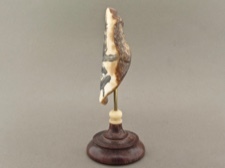 This piece is 2.5 inches long and 1 inch at its widest. On its stand it is 4 inches tall.